Sometimes I go through phases. I’m also like this with food. Sometimes I’ll resolve to make everything from scratch, to hell with all things boxed and store-bought! 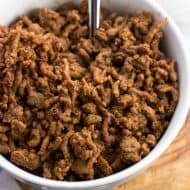 When I read the Little House on the Prairie series when I was younger, I would dream about all of the produce I could can, the meat I could preserve. We would be set through winter! Then I probably walked into the kitchen and grabbed an ice pop from the freezer because, you know, refrigeration. More than infrequently though with the rat race of work, I’ll find myself reaching to a pre-packaged something or other to help me through. 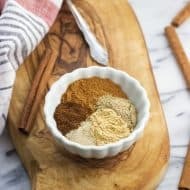 Apple cinnamon oatmeal packet? My good ‘ol afternoon pal. Granola bar? We’re friendly too. As long as I’m confessing, sometimes I reach past the fab salt and pepper whole pistachios (which I love) for the plain shelled ones in the work kitchen cupboard. Convenience. Currently, I’m existing in a happy medium of the two, and I think this is where I’d like to stay. These Easter-fied rainbow cookies brought me out the funk, as they’re a total labor of love without a shortcut in sight. Then I doctored up pre-made dough for these quick onion crescent rolls. Moderation’s the key, baby! So when B was craving Pop Tarts, I took the opportunity to make them from scratch, something I’ve always wanted to do. I think he was a little concerned that my offering to make them, when we were standing in front of the wall of Pop Tarts at the supermarket, was really a ruse to healthify them beyond recognition. He wasn’t entirely wrong, as I used white whole wheat flour and reduced-sugar preserves, but butter was still invited to the party. You can’t even tell the flour mixture includes whole wheat and the preserves are lower sugar, promise. While I swung over to the Laura Ingalls side of the fence a bit with these homemade strawberry frosted Pop Tarts, I still dangled my toes on the convenience side, too. 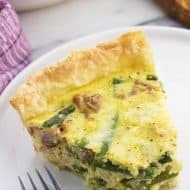 I made these the day-of for breakfast, so I wanted a quick pastry dough that didn’t require much inactive time. No chilling required here! Can I tell you that these Pop Tarts flew off the plate, with the frosting just barely solidified? 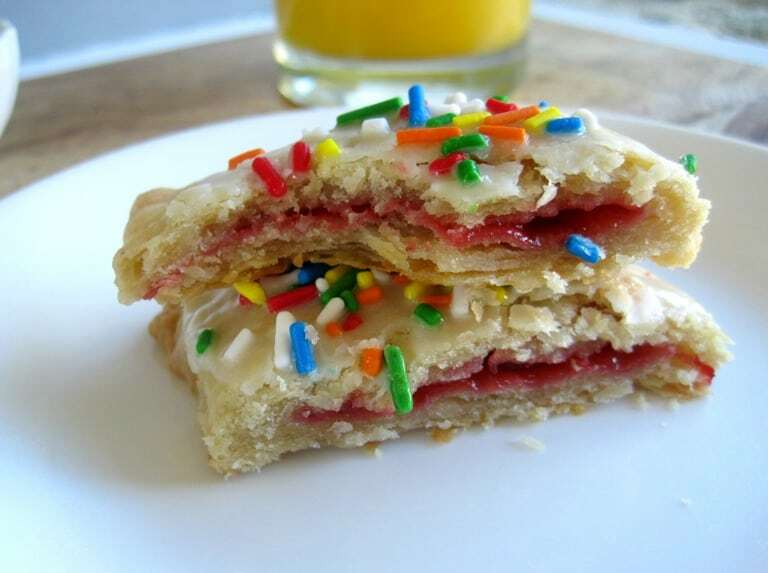 And Pop Tart connoisseur B would like me to tell you all that despite his initial grumbles of seeing me grab the “healthy flour”, these were flaky and delicious. He would like to add that he ate three of them the morning I made these, and wanted to eat more but I made him stop. His words, folks. 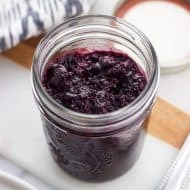 Stir together strawberry preserves (or preserves of your choice), cornstarch, water, and vanilla extract in a saucepan set over medium to medium-low heat. When mixture begins to bubble, let simmer for a few minutes, stirring occasionally. Remove saucepan from heat and let cool while you prepare the pastry dough. Preheat oven to 350°F. Grease a large cookie sheet and set aside. Mix together flours, sugar, and salt. Pour dry mixture into a food processor, then add butter cubes straight from the fridge. Pulse in food processor until butter cubes have been reduced to small chunks (about 1/4" wide) and are well-integrated with the dry ingredients. Alternatively, you can add dry ingredients to a mixing bowl and cut in butter cubes using two knives. In a bowl, stir vinegar, 2 tbsp egg whites, water, and vanilla extract together. If using the food processor method, turn out butter mixture into a mixing bowl. Pour the wet ingredients into the bowl with the butter mixture, and stir until ingredients are just combined. 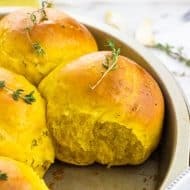 You should be able to press together the dough with your hands to form one large ball of dough. Divide it in two. On a floured surface, roll out one half of the dough into a rectangular shape, approximately 1/4" thick. Using a pastry cutter or sharp knife, cut out eight equally-sized rectangles of dough (or, pretty close to equal). Place rectangles equidistant from one another on the prepared cookie sheet, then brush remaining 1 tbsp of egg whites around the edges of the dough rectangles (for adhering purposes). Repeat the process of rolling out dough and cutting rectangles with the remaining dough. Keep these eight rectangles to the side for the time being. Press the eight rectangles cut from the second batch on top of the ones with the filling, and using your fingers or the back of a fork, press down on edges to seal. Using the tines of a fork, pierce a few holes in the top of each pastry to let air escape while baking. Bake pastries for 20-22 minutes, or until tops of pastries are golden brown. Remove, and let cool on a wire rack. Whisk together all ingredients, except for sprinkles, in a small bowl, adding milk a little at a time so frosting doesn't become too liquid-y. Once pastries have cooled, set them on a sheet of wax paper or on a wire rack set over paper towels. Spoon frosting over top of each pastry, then decorate with sprinkles. Frosting will harden in 10-15 minutes. These are gorgeous – so festive with those sprinkles! Alyssa, these are cute! Perfect shape and I love the added spirinkles 😀 I’m always into one phase or another. Making everything from scratch top of the list. I’m trying to teach my kids that homemade is so much better than the boxed stuff. They almost always agree. 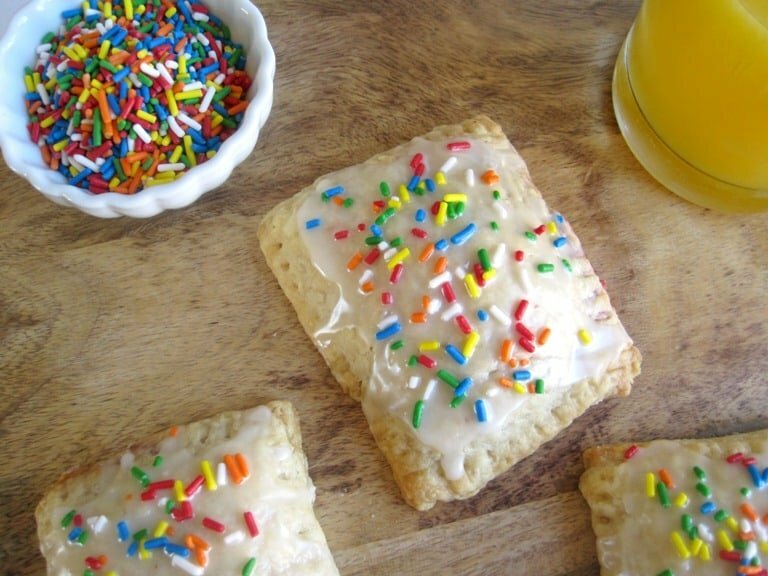 Added sprinkles in the A.M. are always a winner in my book – especially on these Pop Tarts! I agree, there is something inherently special about foods make from scratch. You can definitely taste the difference! Hahaha your struggles for whole foods and making everything from scratch versus convenience sound a lot like mine! I often have high aspirations and hopes and then… nothing gets done. 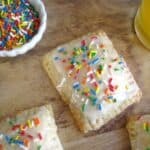 These pop tarts looks pretty freaking fantastic! I can see why B downed 3 of them in no time! I dangle my toes on the convenience side, too! These look absolutely delicious, Alyssa, and so cute! I love the strawberries and the sprinkles. Pinning! I think I would have wanted 3 of these for breakfast, too! It’s so satisfying to make something that you usually buy packaged from scratch, isn’t it? Putting this on my ‘things to make from scratch’ Pinterest board! Omg I love these. And I love your narrative. 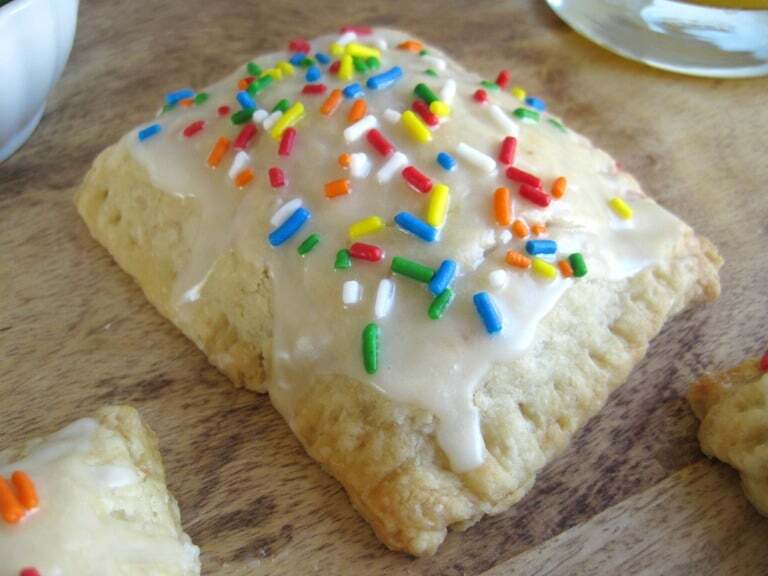 Cutest pop tarts ever! I just adore the bright and cherry sprinkles and the irresistible strawberry filling! 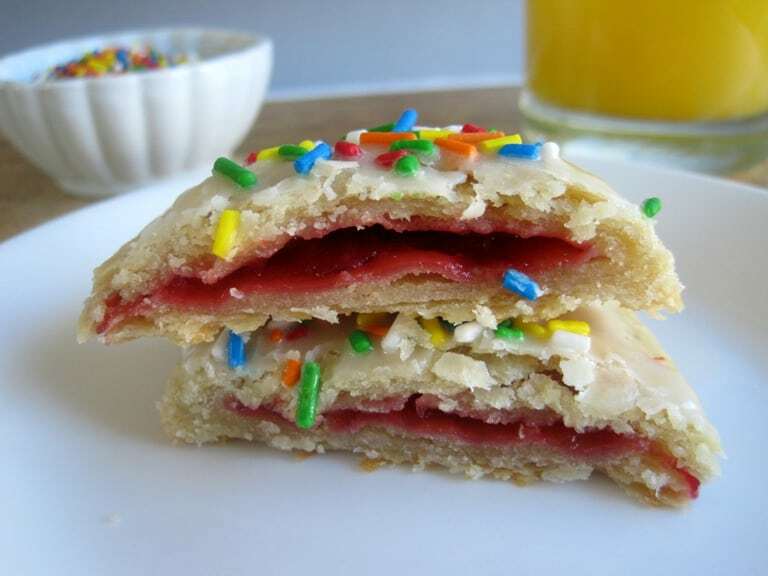 I absolutely love pop tarts and yet its never occurred to me to make my own! This is a DOH! moment for sure! And, they look absolutely lovely and delicious! Nicely done! Thanks Kristi! Of course they are more work than popping a store-bought one in the toaster, but I was so pleased with the outcome! A special breakfast for sure.